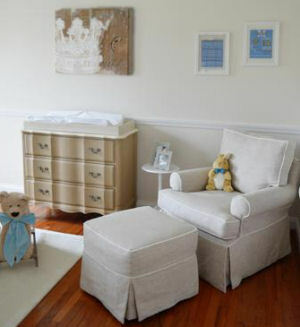 We planned the design for our Little Prince's nursery lair so that the decor is both baby friendly and sophisticated. The room is to be a haven for me during late-night feedings and a place where my baby can learn and explore in safety surrounded by loved and security. When we made the decision that our baby boy's middle name will be "Machiavelli", it seems fitting that we refer to him as our "Little Prince". Our little Machiavelli is so precious and dear to us both. My husband and I were married in Castle Odescalchi in Bracciano, Italy. While on our honeymoon in Tuscany, we came across a pub that my favorite author, Niccolo Machiavelli, frequented and where he wrote one of his best works titled "The Prince" and that was my inspiration for decorating my baby boy's nursery. 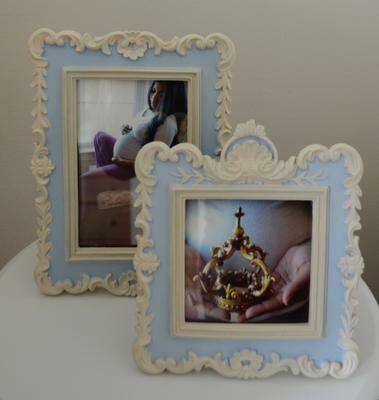 These are pictures from my pregnancy photo shoot displayed in artsy frames throughout the room. 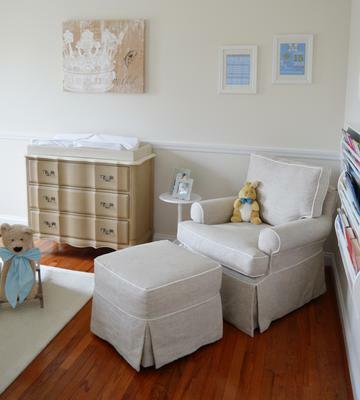 I love that the nursery glider and ottoman are located right next to the book shelf so that as baby grows, it transitions from a feeding chair to a reading nook. I have the books, "The Prince" and "The Little Prince", proudly displayed alongside Dr. Seuss and Peter Rabbit. 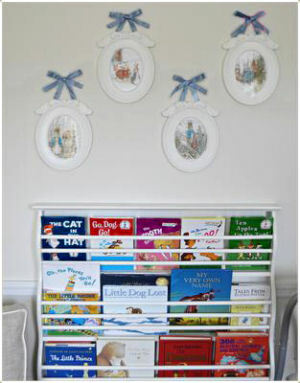 The arrangement of Peter rabbit art that you see over the bookshelf are printouts that I framed with white, oval picture frames hung with blue ribbon. A craft project that was very much DIY. 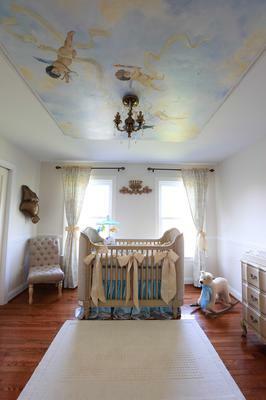 The baby's nursery colors are ivory, gold and blue. Since I want a baby girl next time around (keeping my fingers crossed! )I chose neutral colors for the furniture and the walls. I also designed the blue accents of the baby bedding, bows etc., in such a way that they could be swapped for pink accents in the future when we are ready to decorate a princess nursery theme. I included many personal touches in the room as you can see from my baby boy's nursery pictures above. My favorite feature in the nursery is the custom trompe de l'oeil nursery ceiling mural with its apparent Italian influence and a special angel painted in my likeness so that baby knows that I am always watching over him. I also had two cherubs holding a harp and a torch included in the design to respectively represent the gifts of music and wisdom. There is also a private message written to my baby in Latin on the banner that are intertwined about the cherubs. The custom crib bedding has been monogrammed with my baby's initials and has crown motifs embroidered on the accent pillows. I had the bed skirt made from fabric that matches the bow on the rocking horse. I hung a belly cast of my 34 week pregnant belly that is painted bronze to match the rest of the decor on the wall to the left side of the crib. Directly behind his crib, I had a custom crown painting done with my son's name on it. I also took an excerpt from the "The Little Prince", the original French version and had a custom wall decal made of the quote to display over the door. I want his third language to be French and this quote will serve to give him an early introduction to it. And finally, once my precious one was born, I had two matching wall hangings made. One of the hangings has his birth stats (height, weight, length, etc.) and the other has lines from "The Night You Were Born" all matching the color scheme of ivory, gold and blue and topped with a gold crown, of course! Unique Baby Gear Ideas hopes that our visitors have enjoyed Maddy's Little Prince's nursery lair reveal as much as we have! All I can say is WOW; your little prince's room is out of this world! It is so elegant and yet so down to earth with the Peter Rabbit art over the book display. I am so envious (yet truly happy for) of anyone with the talent to put together a nursery like this. Congratulations; your hard work really paid off. William and Kate would be jealous because not George would have such a grand nursery! This nursery is gorgeous! I love how you have so many personal touches. I'm due in another three months and your nursery has truly inspired me. Thanks for sharing.